Meet Briony, Woodland Park Zoo’s new female siamang. Briony arrived at the zoo last fall in need of a new partner after having lost her previous mate. She has been adjusting well to life with Simon, Woodland Park Zoo’s male siamang. This week, Briony has been adventuring outside the familiarity of her indoor exhibit space to the beautiful outdoor landscape the siamangs share—though so far she has stayed pretty close to the door! Over time, as Briony builds her bond with Simon and becomes more comfortable with her outdoor exhibit, we hope to find the two high up in the treetops singing their new duet together. 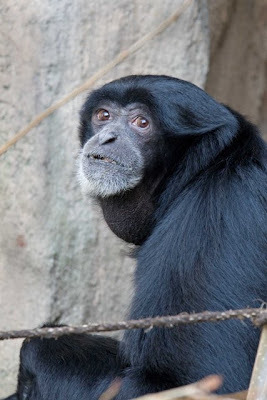 Siamang vocals are so powerful that many zoo neighbors in Phinney Ridge and Fremont are able to hear the siamangs’ song in their homes. Sutera, Simon’s previous partner, was called on a Species Survival Plan (SSP) mission to Little Rock Zoo to be matched with a 5-year-old male. This pair has been selected by the SSP as a good match to best preserve genetic diversity in the captive population of this critically endangered Asian lesser ape. The siamang is the largest of the high-flying, canopy-dwelling gibbon family. This lesser ape shares the same tropical rainforest habitat with orangutans, an Asian great ape. This habitat is rapidly disappearing due to human population competition for space and worldwide demand for low-cost forest products and palm oil. Look for Simon and Briony in the Trail of Vines exhibit in the Tropical Asia biome at Woodland Park Zoo.